One of the typical problems a lot of people experience when sleeping on a regular foam mattress is that the surface can begin to feel too hot or too cold. This leads to discomfort and may cause you to wake up time and time again, tossing and turning a lot. Sleeping on an organic mattress with a wool mattress protector can help improve the quality of your sleep by regulating your body temperature. 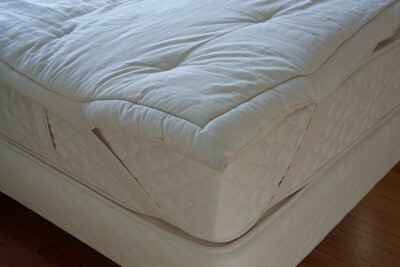 Mattress pads are typically overlooked and deemed unnecessary, but they can be multi-functional in a sense that they protect your mattress while providing extra comfort for you..
A wool mattress pad is comfortable because of the material. It is naturally water repellent, so any type of moisture should dry easily and quickly, making it ideal for infirm sleepers, elderly, or children. High-quality wool mattress pads are made of the finest merino wool. Natural and organic wools are preferred because they help keep the body cool in the summer and warm in the winter. This way, you can sleep comfortably without feeling too hot or too cold. This type of wool comes from sheep, which have not been exposed to harmful pesticides or kept in stuffy cages, and are treated inhumanely. These sheep are allowed to graze freely and eat grass that has not been treated with pesticides, too. Hence, they have a stronger immune system, and they produce some of the finest wool that is used in organic mattresses and mattress pads. Sleeping on a wool mattress protector is healthy, too. Since the material is free of toxic chemicals, you do not have to worry about inhaling toxic fumes or having harmful chemicals enter your body through your skin. This way, you can sleep comfortably without any worries, because you know that the mattress and the mattress pad will not cause health problems and allergies in the long run.